Shopping for Saturday Night Live Bobble Heads? Friends don't let friend-of-friends bobble and drive alone. Display Ace and Gary driving around town in their ambiguous "Duo" mobile. This limited edition bobble is an Entertainment Earth convention exclusive! Entertainment Earth Convention Exclusive! The way Ace and Gary see it, if you’re going to build an Ambiguously Gay Duo car, why not do it with some style? It’s one of the reasons Bif Bang Pow! 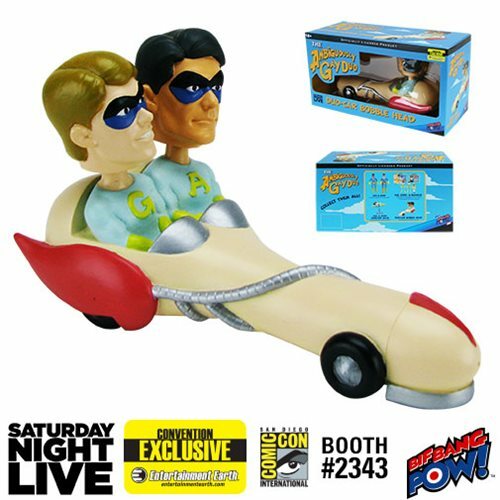 is bringing collectors the Saturday Night Live The Ambiguously Gay Duo Car Bobble Head - Convention Exclusive! Direct from the hilarious Saturday Night Live cartoon “The Ambiguously Gay Duo,” comes this premium bobble head featuring Ace and Gary driving their infamous "Duo" roadster shaped like a… errr, rocket. This limited edition Entertainment Earth convention exclusive measures 7-inches long x 4-inches tall. With a production run of only 1,500 pieces this crime fighting Duo won't be around forever. This item has features and themes that are for adults only. Ages 18 and up. Recommended for mature collectors. Straight from Saturday Night Live, comes that crime fighting Ambiguously Gay Duo featuring friend-of-friends Ace, voiced by Stephen Colbert, and Gary, voiced by Steve Carell, saving the city from a bunch of gawkers that can't take their eyes off them! Created by Robert Smigel and character designs by J. J. Sedelmaier, this hilarious cartoon would never have made the cut on Saturday morning.